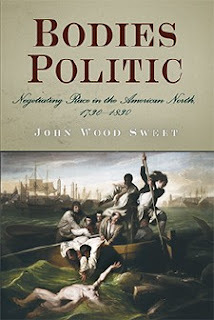 I recently finished reading John Wood Sweet's Bodies Politic: Negotiating Race in the American North, 1730-1830 (2003). In part, this book is a project of recovery — Sweet points out that while "American came to present itself as a white nation," the reality was that "it was, and had been from the start, diverse, hybrid, and multiracial" (10). His basic argument is that racism in 18th-century New England was not a matter of cultural misunderstanding — in fact, as people of color converted to Christianity and assimilated other aspects of European culture into their daily lives, they found themselves even more reviled by their white neighbors. Over the course of the century, "stubborn, essentialist identities of race . . . supplanted a potentially mutable form of difference — culture" (108). The larger point is one that is often difficult for proud New Englanders to swallow: even though the Civil War pit North against South, the war and its memory "has obscured underlying similarities that derive from a shared legacy of colonialism" (11). I recommend this book to anyone with an interest in American History, particularly if that interest is focused on southern New England. Sweet's title says "the American North," but what he really means is Rhode Island with some eastern Massachusetts and a smattering of Connecticut. That was great for me — I love Rhode Island history —but readers looking for Pennsylvania or Maine will be disappointed. Bodies Politic is a thick book (409 pages), but an easy read. Sweet employs many engaging vignettes to make his points, which makes this a great book for the casual reader or for the academic looking for some arresting anecdotes for lecture. When Paul Revere set out on his midnight ride in April 1775, one of the first landmarks he passed was the body of a long-dead slave — a figure that represented, no less than the Sons of Liberty themselves, a colonial family drama of abused paternal authority, emasculating enslavement, and rebellion. Revere knew the body by name. Mark's remains, suspended in a metal gibbet overlooking the road, had been greeting travelers for some twenty years — since 1755, when he was hanged. His accomplice, Phillis, was burned at the stake. Their crime had been killing their master, Captain John Codman of Charlestown. I was already somewhat familiar with the case of Mark and Phillis because all the graduate students have been talking about Blindspot lately, but I hadn't really assimilated the image of the gibbet into my mental picture of late colonial Boston. When I think heads on spikes or bodies suspended near the road, I'm thinking 17th-century Ireland or the Caribbean, not Stamp Act-era Boston. You won't see any gibbets in the John Adams miniseries, that's for sure. Now, I have adjusted the image in my mind, though I can't quite imagine what a 20-year-old exposed corpse looks like. Blanched bones? Strips of ragged cloth? A pile of dust?